Mörk Chocolate Brewhouse – Calling All Chocolate Lovers! 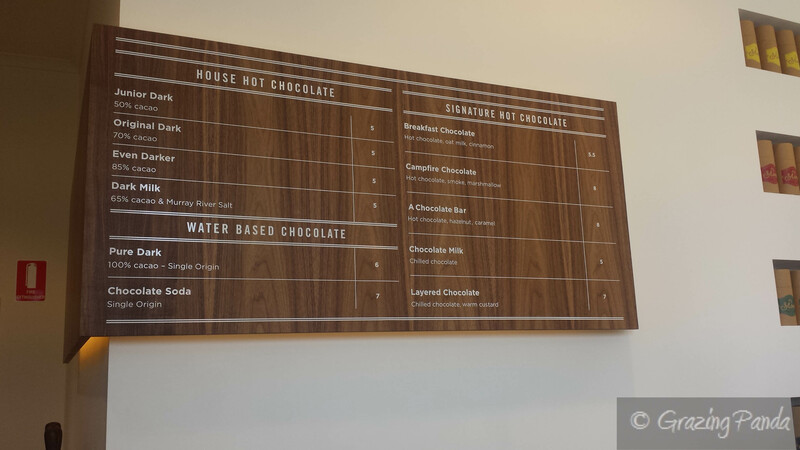 I have always loved Hot Chocolates so was excited to learn that one of my favourite brands of Hot Chocolate – Mörk – had opened a café / brew house / specialty store – solely dedicated to hot chocolates; yep that’s right no coffee in sight! This has been a long awaited move for co-founders and partners Josefin Zernall and Kiril Shaginov – who come from a speciality coffee background – and wanted their customers to be reminded of their childhood. Both used to work in Sweden at a coffee roaster together and started up Mörk in 2012 and have been supplying a number of Melbourne cafes with their Chocolate for over three years now. Mörk Brewhouse is located in Errol Street in North Melbourne in a space that used to be a 1950s bakery warehouse. It has a very modern, light filled and welcoming air about it – from the friendly staff at the counter who take the time to welcome you personally whilst preparing hot chocolate for other guests to brilliant aroma that fills the air. The space is intimate yet doesn’t feel crowded – seating just 18 people at a time – featuring bleached wood, angled grey tiles with brass accents. The warehouse attached to the café will make chocolate on site. There are also shelves which stock product for you to take home to enjoy the blissful Mörk products for yourself. I absolutely love the crockery they use as well – imported Japanese Arita porcelain – custom made beakers to house the delicious and rich chocolate when it is presented to you. Chocolate is similar to coffee – it has different classifications, varieties and single origins – all of which has a focus here at Mörk. You can find a range of drinking chocolate blends (starting from 50% cacao (Junior Dark) and going up to 85% cacao (Even Darker)) as well as new ingenious chocolate combination delights which include the Breakfast Chocolate (House-made Oat Milk, Dark Chocolate and Cinnamon), A Chocolate Bar (Hot Chocolate, Hazelnut and Caramel). The little ones aren’t forgotten here with a specially designed menu for the them – Chocolate Foam (Milk Foam with Chocolate Sparkle) and Mini Chocolate (Junior Dark Chocolate with Marshmallow). There are also small sweet treats available which are either made in house or off-site using Mörk’s specially crafted recipes such as – Hazelnut Financier, Lemon Financier, Brioche and Hazelnut Spread (all $5.00) and Canele ($4.00). There are also small sized pieces of chocolate on offer for you to enjoy – Smoked Vanilla Water Based Truffle and Pure Alba Cinnamon (both $3.50) and Marshmallows ($1.50). We arrived around 3:30pm on a Sunday to a line of people – both waiting for a seat inside or for takeaway. We needed a table for three and were told by the friendly staff that it would be around a 15 minute wait. We were happy to wait and enjoyed the aroma of the fresh chocolate being prepared for the other patrons, as well as looking at what products were available to buy. Once we were seated we were served sparkling mineral water that had been infused with Vanilla Bean which was to cleanse our palate. The Vanilla Bean flavour was subtle yet strong at the same and was super delicious! You could really see yourself having a bottle full of this mineral water. Even Dad loved it so much so he wanted to try and infuse his own mineral water at home! We ordered our drinks and eagerly waited for them to arrive. Dad ordered the Layered Chocolate – Chilled Dark Chocolate with Warm Custard. The combination of the rich warm chocolate together with the cool vanilla bean infused custard was delicious. The custard added an extra depth of flavouring to the already brilliant tasting chocolate. Mum ordered the House Hot Chocolate in Original Dark (70% Cacao) which she enjoyed. The delicate note of the Cacao Venezuelan chocolate was rich, smooth and delicious. 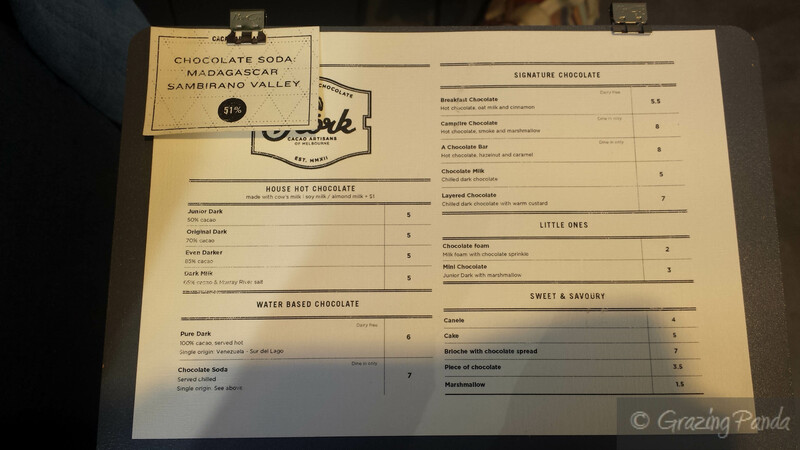 I ordered the Campfire Chocolate (Hot Chocolate, Smoke and Marshmallow). I love how this “dish” comes served – on a wooden board. The hot chocolate is served in a porcelain beaker with a caged glass that is smoked with the wood of the day – on this day it was Beechwood, a house made marshmallow and finished with a pinch of smoked salt. The staff explains that you lift the glass and inhale the aroma from the wood smoked fumes and then pour the chocolate in. You have the option of stirring it through using the marshmallow and adding a sprinkle of salt to taste if you want. The hot chocolate tastes divine – as it has the combination of the cacao together with the smokiness from the infusion of the wood. The marshmallow is like a cloud in your mouth that melts away and keeps you wanting that next bite. I did add a pinch of salt as well – but couldn’t’ really taste the saltiness come through. This really is a must try! I love the concept of the Mörk Chocolate Brew House and the way the place has been fitted out. The service is friendly, warm and welcoming – I really wish it was located closer to the city so that I could go here during work hours! Mörk Chocolate Brew House is currently only open during the day but is looking at introducing early evening Hot Chocolate tasting classes for those who want to further their Chocolate education – frankly who wouldn’t! Keep a lookout on their website and Facebook page for more information about when these will be launching. Menu – Refer to picture above. A selection of hot chocolates, water based chocolates, signature chocolates as well as a menu for Little Ones. There is also a sweet and Savory section.